You are here: Home » Look! Up In the Sky! 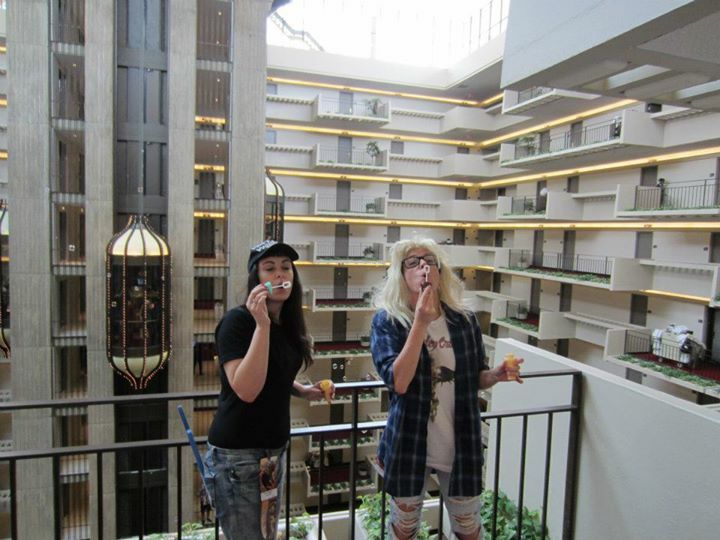 It’s…….DragonCon! No, I’m not talking about back to school time, or the start of autumn. It’s that time of year when average Joes decide to throw on their best superhero costumes and turn some of America’s great cities into the futuristic metro areas of comic book lore. Throughout the summer months (and increasingly throughout the year) a number of comic book conventions are held in the US and around the world. Attendees often dress up as their favorite heroes or villains, and strut their stuff. If you’ve seen the pictures, you may not be aware that it really is so much more than a costume party. At the largest conventions, the attention has slowly drifted away from the vending floor, but to the celebrity filled panels that present “sneak peaks” of coming films, shows, and comic books. Fans will wait in long lines for hours for the chance to be in the audience for the panel, and numerous websites will post the last news within minutes of being presented in the room. When the latest Star Wars trailer was presented earlier this summer, scene by scene descriptions were posted online. These were descriptions of scenes, and the actual movie trailer wasn’t released for another 24 hours to the public. People travel from all over the country, and from all over the world, to attend these conventions. Today, even smaller cities are starting their own comic-cons. Columbus, Asbury Park, Phoenix, and even Birmingham, Alabama host comic-cons. Cities are increasingly realizing the enormous amount of money that attendees will drop on restaurants, hotels, and nightlife, and even if they are doing it dressed as Batman, Archer, Jean-Gray, or Walter White, their money is going to talk and cities are going to listen. To get the full scoop on the planning that goes into preparing for a convention weekend, and more importantly what goes on, I talked to Lauren Castor, who has more than a few DragonCons (the large Atlanta comic-con taking place the weekend of September 4-7) under her belt. She’s had some pretty impressive costumes and experiences over the years. Brad Toland: How did you get started doing it? what was your first time there like? 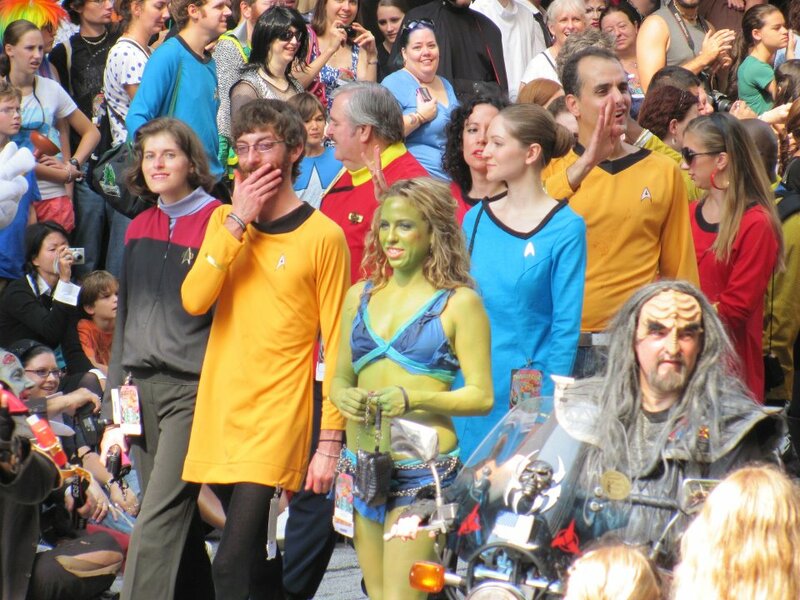 Lauren (in Star Trek Orion Slave Girl costume) at DragonCon. Lauren Castor: I have been a huge nerd my whole life. I guess it started back when I was in the second grade and I discovered Star Trek: The Next Generation, and fell in love. (With the show AND Wesley Crusher. I know. I know.) I devoured all things Star Trek growing up. And one of my all-time dreams was to be able to attend a Star Trek convention. I’ve always loved making costumes and getting to dress up, and I always said that if i ever got to go to a Star Trek Convention I would paint myself green from head to toe and be an Orion Slave Girl, but I never actually figured it would be something I could actually do until about six years ago when my ex-husband got us tickets for a Saturday at DragonCon so he could get some comics signed to sell on Ebay. I took the opportunity to paint myself green, ripped up an old dress, and made my dreams come true! It was like going home. I had never had so much fun in my whole life. I was hooked. BT: What’s the appeal of this type of activity? LC: I think it depends on the person. People cosplay for all kinds of different reasons. For some people it’s like, the culmination of a huge year-long art project, as they’ve poured their hearts and souls and labored over a cosplay. For others it’s a chance to come together with other like-minded people and celebrate their favorite characters. Some people take it very very seriously – people like Yaya Han do it for a living. For me, it’s a mix of it all. DragonCon is like a huge family reunion with all of my best friends that I only really get to hang out with once a year. We spend all year working on our cosplays then come together to CELEBRATE BEING DORKS TOGETHER! My cosplays are all characters that I love, and I just have as much fun with it as I can. BT: What makes for a good costume? LC: Once again, it depends who you ask. I think on the whole, craftsmanship is a big deal. There’s a stigma against store-bought costumes… cosplayers tend to think you should make it yourself as much as possible. But that’s not always a big deal. Some people think that looking as much like the character you’re cosplaying is important. I don’t, though. For me and in my cosplay, I pick out my favorite characters, and try to do my best to “do them right” when DragonCon rolls around. I pick a lot of obscure characters… the ones that not many people recognize.. but the people that DO get it…. it’s like the COOLEST THING EVER! Those are my favorite. Lauren (right) in Zardoz costume. It’s obscure, but completely dead on. BT: How do you decide what to wear? How to you avoid someone dressing up as the same things? LC: You wear whatever you want…. and you can’t really avoid that. In fact… at DragonCon, you’re doing good to NOT see 500 Harley Quinns, 2,000 jokers, about 5 billion 10th/11th Doctors… and that’s ok.
BT: How many costumes do you go through in a convention? LC: It really depends! this year I’m taking 3 costumes. I’ve taken up to 6. It gets pretty stressful trying to change so much, though, so I try to keep it to 3 or 4 for the 4 days i’m there. Some people take more.. some people just pick one day to cosplay and stick to one. It’s whatever you wanna do. BT: What goes on at the actual convention? Is it a big party? LC: Different conventions have different feels. DragonCon is definitely one big party (with other stuff to do if you want to do it.) They call it “Nerdi Gras” for a reason! BT: Do people take pictures of each other or is everyone in it for themselves? LC: Some people are in it for themselves, but for the most part, EVERYONE is taking pictures of EVERYONE! BT: What kind of things do the vendors sale? LC: Anything and everything. Art. Tabletop gaming things (like dice and games and whatnot). Cosplay products like wigs, makeup, body paint, and ready-made outfits. Kilts…. bellydancing stuff… stuffed animals, t-shirts… I really try to stay out of the vendor’s room because I don’t want to spend ALL OF MY MONEY on the stuff (and I will).. but anything you can imagine, you can probably find it. BT: Best costume you’ve seen? BT: Best costume you’ve made? 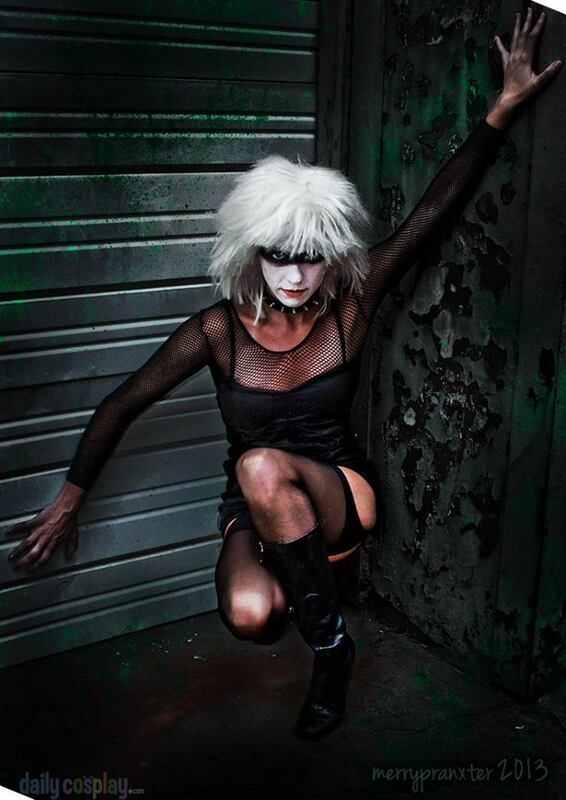 LC: I’m partial to my Pris costume. (Blade Runner, 1981). I made the dress out of a cheap black dress I bought at a chain store in the mall. I bought one of those net bodysuits from a low end lingerie store, cut out the top of it and sewed it into the dress along with a black bra. I just stiched it all in there together… gathered the front of the dress up shorter, and stitched a shimmery nylon fabric over the top of it to give it the shine that Pris’s has in the movie, and sewed a pair of black boyshort-undies into the bottom so I wouldn’t flash people. I got the stirrup hose online… boots from a thrift store… and made the necklace out of a dog collar! I distressed the wig with an iron (melted & frizzed and messed up). And then you just do the white face paint with the black across the eyes. I think I did a dang good job on it. BT: I agree. It’s a great look, and really comparable to the actual character. How do people feel about store bought costumes? Is the more original the better? LC: Yes very much. Most people feel you should have at least commissioned someone else to make it for you. Like I said, though, you can totally tell those people to shove it if you want to wear a store-bought outfit. It’s really not a huge deal. BT: Do you have to dress up? How dressed up should a person be if they want to attend? LC: Of course not! You never have to do anything you don’t want to do. While they’re the ones all the pictures get taken of (because they’re in costume)…. cosplayers are not the majority. There are more people in plain clothes than costumes. People go to con for different reasons – there are so many different activity tracks that you could never hope to cover even half of it in one weekend. Some people go for the panels, or to see their favorite stars in interviews… or to play roleplaying games (like D&D) in the game room… or to take pictures of people in costume. Then there are the people that go for the cosplay. It’s all one big happy family once you’re inside. BT: Nice! Any tips you can share to a first timer to make sure they really and make the best use of their time there? LC: Take all of your expectations of how the weekend should go… and throw them out the window. You have to be able to roll with the punches. You can not plan this weekend. It will not go the way you planned if you do. If this is going to ruin your time… you need to find a smaller convention. If you are friendly, people will be friendly to you. Oh, and wear comfortable shoes because your feet are going to HURT! By they way, Lauren points out that you never know who you could run into. In recent years, it’s become quite trendy for celebrities to attend, some hidden behind masks (Jamie Lee Curtis was spotted last year with a helmet on, and Daniel Radcliffe has shown up at dressed as Spider Man. 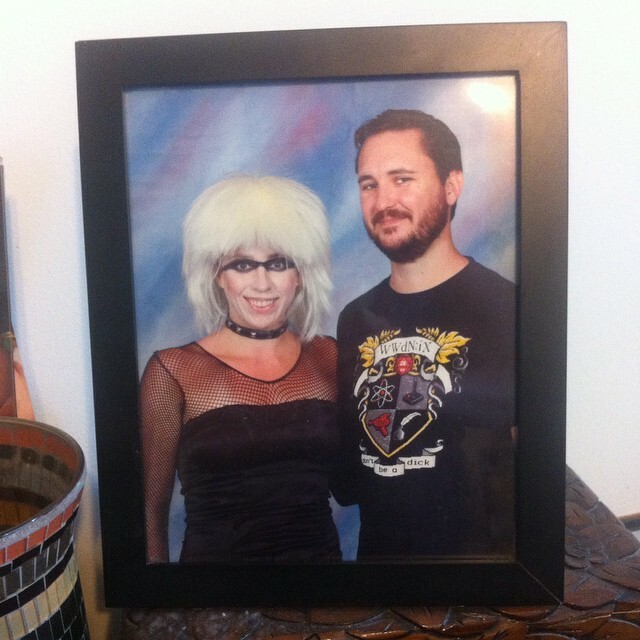 Then, Lauren did get to experience what she describes as the “nerdiest moment of her life” at a convention, too. Get the Toland Travels Postcard maker app! It’s a damn good app. Are you following Toland Travels?